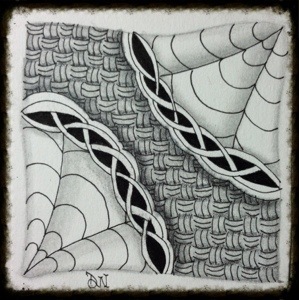 Day Fourteen was all about the “Decorative Value” technique that you can bring into your Zentangle tile. For those that are not familiar Decorative Values, it is using different levels of shading to give depth. On my piece, I use three different levels of shading; one per plane. The lightest plane, therefore appearing the closet, I used a new tangle called Chainging. The second plane, or second lightest shade I used another new tangle called Dyon. Last, but not least, I incorporated a pattern I have used before called Keeko. Keeko was used for the third and darkest plane. Overall I was pleased with the results of using Decorative Values in the finished Zentangle tile and enjoyed the quiet moment I took to create this.